Led by more than a dozen Hells Angels, a pack of 120 motorcycles snaked around the winding country roads north of Albany last weekend. Each bike sounded like thunder, but to grazing horses and elderly drivers the combined noise was indistinguishable from Armageddon. Want to know what patched gangs do for fun? This is it. 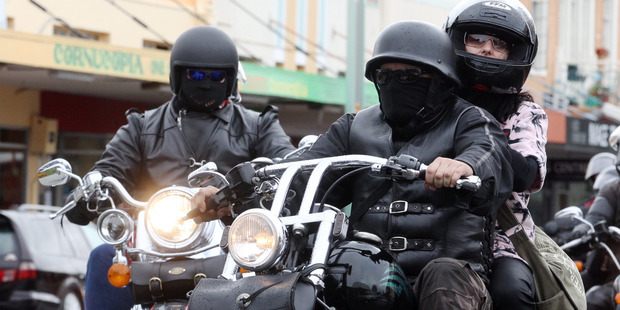 Poker runs are organised by outlaw motorcycle clubs (they prefer the term "clubs" rather than "gangs") that combine motorcycling and gambling. There are five stops, usually country pubs, and at each you draw a playing card. The best poker hands win prizes. The Nomad Hells Angels chapter has a slight variation and use dice instead of cards. I've attended many of these games of chance but never did my luck run quite so dry as when one of the Devil's Henchmen clipped me from behind last year on the outskirts of Christchurch. A grim combination of tarseal and gravity led to a busted wrist, an ankle, six ribs, and a ruptured liver. My head bounced off the road so hard that memories of the day rattled free, which is just as well because by all accounts I wasn't having much fun at that point. Adding insult to injury, when I recovered my senses I learned there were no prizes for having the most bones broken. The reason for that, perhaps, is that crashes are rare. 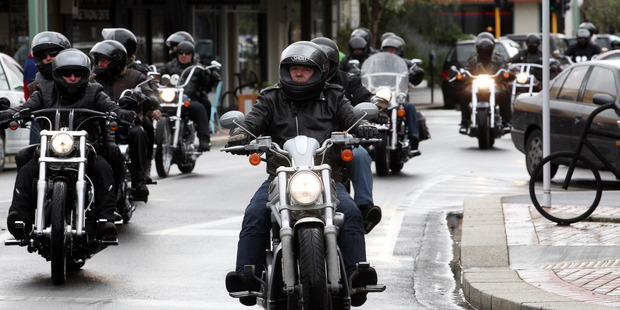 The motorcyclists are staggered in formation to allow room in front, behind, and to the side of each bike. The president always leads the pack followed by office holders who are followed by other patched members. It's considered poor form to overtake a member. Only a fool who has lost his mind would pass the president. A broken pack can lead to riders speeding or getting lost, so prospects are sent ahead to stop traffic at bigger intersections. The police sometimes undertake that task. At last weekend's event, officers halted traffic but were otherwise low-key, telling me their job was simply to ensure road safety. On some events the relationship is not so cordial. While many people stop and watch the bikes go past with jaws hanging, some join the ride. Other patched groups are by invitation only but members of the public are free to ride along. The cost is $20 to enter and some runs don't allow Japanese bikes; a ban that harks back to the formation of the outlaw clubs by ex-American servicemen after World War II when anything Japanese was viewed less than fondly. But poker runs are not just times when the public interacts with the outlaw clubs, so do many businesses. Companies sponsor the events offering prizes like motorcycle helmets, tyres and jackets, as well as vouchers for alcohol, tattoos, and entertainment in massage parlours. Last weekend there were nine bags full of prizes, and first was worth around $2000. A raffle that was drawn under the watch of a Justice of the Peace had a top prize of a trip to Thailand. The JP has done it a few times before and he was impressed by the organisation of the events. He had grown to respect the lads. They weren't what you had expected? No, he said with an ageing smile, they are a long way from that. Their camaraderie really is something to admire, he told me. The proceeds of the run will go to Heart Kids New Zealand, because one of the Hells Angels' sons had been unwell and was assisted by them. Journalists rarely cover poker runs or similar events, but they have a long history. In 1960, the Auckland Star reported that the Hells Angels, at that time all teenagers with nicknames like "Animal", "Crazy" and "Pinky", had taken several crates of soft drink to orphanages on the North Shore and in South Auckland. These groups have always had a nuanced existence, but it is their scrapes with the law that define them. "When we do right nobody remembers, when we do wrong nobody forgets" is a refrain often used by Hells Angels. From a distance the pack of bikes sounds like angry bees, and as the poker run roars past the maximum-security prison at Paremoremo it stirs up that hive. Behind bars, men hear the seemingly endless stream of bikes and lament their own predicament. Outside the Angels enjoy the warm Auckland day and the freedom only motorcyclists know. As outlaws with a rebellious view of straight society, many appreciate it's a fine line between someone who only hears the bikes and someone who rides them. Dr Jarrod Gilbert is a sociologist at the University of Canterbury and the lead researcher at Independent Research Solutions. He is the author of Patched: The History of Gangs in New Zealand.